Simon Westover is a Romantic who pens saccharine poetry and purple prose, and is the secret identity of The Busybody, an advice columnist in The Ladies’ Fashionable Cabinet. Eleanor Tennant is a pragmatist who believes Romantic ideals are irrelevant to the sometimes bitter realities of life. Two warring philosophies collide in a comic road story in which the dreamer becomes a man of action and the hard-headed realist learns that sometimes you can follow your heart. The idea for this trilogy came straight from Candice’s Collections. Learn more about the collection inspired the stories, the political background that fueled the era, as well as the literary model for the hero of Once a Dreamer. Library Journal says: "Although employing a tried-and-true classic "hot pursuit" plot, the beautifully rendered characters, the depth of their conflicts, and the intriguing twist that the hero is a true Romantic and the heroine is anything but, make this historical just short of brilliant and a cut above the rest." Romance Reviews Today awards a "Perfect 10" score to Once a Dreamer. Their review says, "Once a Dreamer is a delight! 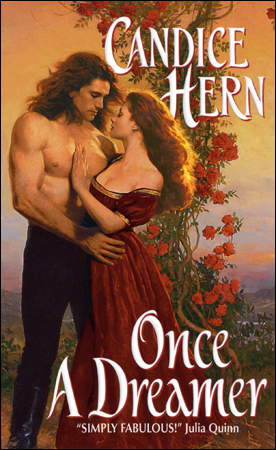 The attraction of opposites is a familiar theme in romance novels, but Candice Hern's unique, utterly charming characters make this story fresh and new. ... Readers will adore this marvelous duo and will cheer Simon and Eleanor along the sometimes rocky road of their courtship, battling wills and wits with the runaways - and each other. With crisp, witty dialogue, simmering passion, and realistic interactions between the characters, this well-written, entertaining tale is sure to please!" Romantic Times Bookclub awards 4 stars to Once a Dreamer. Their review says: "Candice Hern’s fresh voice shines in this utterly charming, highly entertaining romance where the woman is the cynic and the hero a true romantic. Turning the tables on stereotypical characterizations makes this tale delightful and unique. Watching as Eleanor’s character changes and seeing the good in human nature come to the fore reinforces everything romance is about." Eleanor, already beyond irritation over how long it had taken to track down the wretched woman, was not about to be so easily dismissed. The impudent fellow had not even gone through the motions of pretending to see if his employer would receive her. One look at her card and he’d made the decision on his own. Officious prig. But he knew not with whom he dealt. The butler appeared near apoplexy, but somehow managed to maintain his dignity as he led Eleanor into a small salon off the entry. “Please wait here,” he said and left the room with more speed than she would have credited a man of his age. Figuring the wait could be a long one if Lady Westover was not yet dressed, Eleanor settled into a comfortable-looking wing chair and took stock of her surroundings. It still surprised her to have discovered the Busybody — that loathsome dispenser of irresponsible advice — in one of the finest homes in Mayfair. The beautiful town house on Portman Square was a far cry from the modest home on Charlotte Street where Eleanor lived with her niece. This room, though, was small and not particularly elegant. No doubt it was used only for those visitors not important enough for the grander rooms suggested by the majestic staircase rising beyond the arched columns of the imposing entry hall. It irritated Eleanor to be placed in such a pokey little room as though she were a common tradesman; but she could not fault the butler for doing his duty. It was not an uncomfortable room. In fact, it was only slightly smaller than their own drawing room on Charlotte Street. She suspected the main drawing room here was larger than the entire house on Charlotte Street, but she was unlikely ever to see it. So she inspected what she was allowed to see and tried to imagine the mistress of the house. And she rehearsed in her mind what precisely she would say to her when she walked in. Or perhaps she should get straight to the point and simply whack the idiot woman over the head with her parasol. When Eleanor had enlisted the aid of her cousin Constance in tracking down the Busybody, they had both been shocked to find the trail leading straight to Lady Albinia Westover. They had first approached the publishing house where The Ladies’ Fashionable Cabinet was printed, but no one would provide them with so much as a hint as to the identity of the Busybody. The printer himself claimed not to know, but Eleanor had not for a moment believed him and had haunted his premises for days before deciding he was never going to divulge the information she needed. Constance had come up with the idea of sending a packet in a very distinctive wrapper to the Busybody in care of the printer. They would then watch the building to see if anyone came to claim the package, which is exactly what happened. But the Busybody was no fool and went to some lengths to protect her identity. They followed the courier who left the building with Eleanor’s package, only to find him handing it off to another man. Hidden behind the draperies of Constance’s elegant carriage, the two women watched one hand-off after another, following a zigzag route that took them from one end of the City to the other, through St. James’s and the West End, through Westminster and finally to Mayfair. When the last courier had descended the steps to the servants’ entrance to the house on Portman Square, it was Eleanor’s cousin who’d recognized the house and knew its owner. Constance, who had married well and was part of a much more elevated social circle than any Eleanor could claim, had met Lady Westover on occasion, but was not well acquainted with her. She was married to Sir Harold Westover, an outspoken Tory member of Parliament notorious for his long-winded anti-reform harangues and sponsorship of various conservative bills. Constance admitted to finding Lady Westover somewhat featherbrained, though dutifully supportive of her husband and his causes. The notion of her secret identity as the romantic Busybody had sent Constance into paroxysms of laughter as they sat in her carriage across the square. Eleanor would like to have brought her cousin along for this difficult interview since she at least had the claim of acquaintance. But Constance could not be trusted to take the matter seriously. It would not serve Eleanor’s purpose to have her cousin burst into giggles at the first sight of Lady Westover. So Eleanor had come prepared to do battle on her own. While she waited, she looked about her and took note of the expensive though somewhat old-fashioned furnishings. She wondered if the public rooms were more up to date than this one. There was not a sphinx or gilded crocodile head in sight, though Constance had described Lady Westover as a woman uncommonly susceptible to the vagaries of fashion. What sort of woman would walk through the door? Eleanor could not reconcile in her mind the image of the fashionable, insipid, dutiful wife of a conservative politician with the flowery prose and starry-eyed romanticism of the Busybody. She hoped, however, that the contradiction would work in her favor. Most likely the politician’s wife would not want her embarrassing secret identity revealed, especially to her stiff-necked husband. Eleanor was more than willing to dabble in a bit of blackmail to get what she wanted. In fact, she was shamelessly anxious to do so. She would cajole, coerce, even threaten if necessary, in order to force the woman to face Eleanor’s niece, Belinda, and retract her ill-considered advice. The Busybody would be made to face the potential dangers of her capricious counsel. Eleanor wanted Lady Westover to squirm. She was smiling smugly at the image conjured up by that thought when the salon door opened. It was not the Busybody. A man stood in the doorway, his head cocked at a quizzical angle as he gazed at her. Too well dressed to be a servant, he was about her own age, tall, a bit on the thin side, with a shock of reddish hair and bright blue eyes. The intense, but unreadable, expression in those eyes disconcerted her. The odd smile slid from the women’s face and she rose from her chair. Simon was glad she no longer smiled. She was much too pretty when she smiled, and he always became flustered around pretty women. “Oh dear God.” Simon thought he might become ill. He wanted nothing so much as to sink into a chair, but Mrs. Tennant stood and so he could not sit. Instead, he somehow managed to move toward the fireplace, where he leaned heavily against the mantel, his back to Mrs. Tennant. Was he leaping to conclusions? It was a common enough term. She need not have been referring to The Ladies’ Fashionable Cabinet advice column. But no. The look on her face had told him the truth. Oh, God. She might as well have planted him a facer with that confirmation. Simon twisted his throbbing head to look over his shoulder at her. He wished to hell she would be seated instead of standing there with that defiant tilt to her chin and green fire blazing from her eyes. “How . . . how did you find out?” His voice came out thin and strangled, no doubt revealing to her every bit of the misery and apprehension he felt in that moment. “No. No, of course not.” Hell and damnation. What was he to do? She must not be allowed to ruin everything. He had to stop her. But how? What did she want? Thankfully, she did as he asked, returning to the chair she’d occupied when he entered the room. She took an inordinate amount of time to settle herself and arrange her skirts before Simon allowed himself to sink onto the settee facing her. If anxiety had not wrapped itself around his chest like a leather strap, Simon would have appreciated the picture she made: green velvet and white muslin and flushed cheeks against the red brocade of the large wing chair. He had always been susceptible to a pretty face. Now was not the time, however, to give in to his libido. She was not there for him to admire. She came with the news he thought never to hear. The Busybody had been unmasked. What the devil? He raised his brows in question. “As I recollect, Miss Doleful wrote with a heart overflowing with love, and elated that her tender affections were returned. Is that not what we all seek, Mrs. Tennant? To experience the full degree of happiness found in a reciprocal affection? “And yet the Busybody constantly offers that sort of moronic follow-your-heart advice. So many of her readers are young girls filled with romantic ideals, each of them panting to become the heroine of a tale of tender sentiment such as they read in the pages of The Ladies’ Fashionable Cabinet and other magazines. Not to mention the novels of Mrs. Radcliffe and her like.” She rose from her chair and Simon sensed that he was in for a lecture. He stood as well and returned to his place before the mantel, facing her this time. He wished he could forget the enormity of her unmasking of the Busybody, and the potential harm she could wreak with that knowledge. He wished she were there on some other errand so he could just sit back and watch her. The lovely Mrs. Tennant was glorious in her outrage. “All these girls,” she continued, “are seeking the heroes of their dreams, and will never find them in the upstanding, suitable young men brought to their attention by parents or guardians who only want what’s best for them. But instead of being sensible, they are encouraged by the likes of the Busybody to receive a good impression from the first man answering their ideas of a handsome, romantic hero. Though there was likely some validity to her fears, Simon suspected the woman was overreacting. Despite the horror stories mothers often used to instill the fear of impropriety in their daughters, most gentlemen of the ton did not go about debauching innocent girls. Those men with reputations as libertines generally kept to widows, willing matrons, and Cyprians. There was the odd blackguard, of course, but he was rare. It was all the fault of Richardson and his Clarissa. Mothers, and guardian aunts, saw the villain Lovelace in every man who dared to flirt with their charges. “My mother?” What the — oh, dear God. She had not known. She hadn’t known the truth after all. She’d thought his mother — his mother, of all people! — wrote for the magazine. God help him, what had he done? Why hadn’t he sat quietly and listened without admitting anything? Simon stifled a groan. Idiot. If he had only been patient he could have assured her that his mother was not the Busybody, and left it at that, giving nothing away. How could he have been so stupid? There was nothing for it now. It would be ridiculous to deny it. But his mouth had gone dry, and he did not believe he could speak the words. He took a deep breath and nodded. “You scoundrel!” She drew her arm back and slapped him hard across the face.